Major von Luck smiled as he poured over the map. His men had driven a deep wedge into the bridgehead established by the British paratroopers. After a brief hold up when the impressive firepower of the Royal Navy bombarded his panzergrenadiers the attack had resumed and pushed on into the Normandy town of Ranville. One more push to overrun the chateau and he’d have pushed the British out of the town altogether. But first…von Luck’s finger stabbed the map where Ranville’s church sat on the flank of his advance…that would have to be taken. 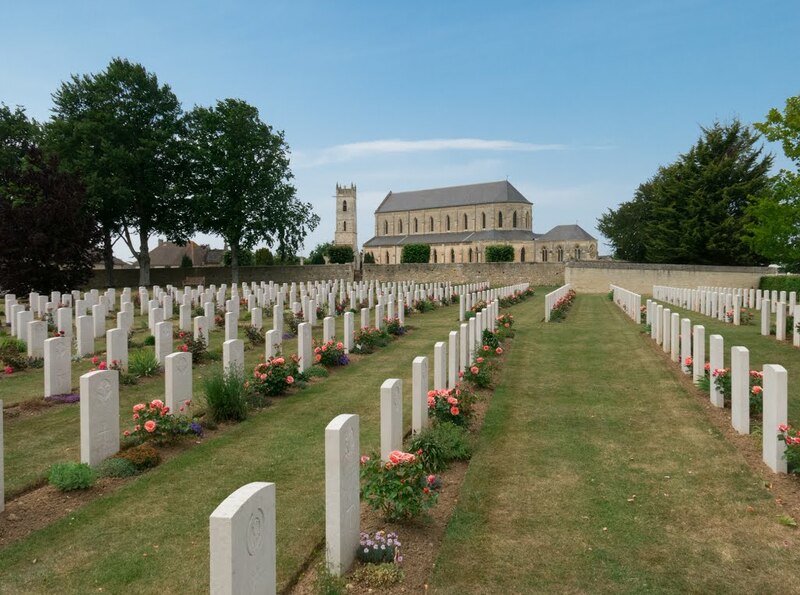 The church at Ranville is home to a large war cemetery these days. The Germans would be attacking from the left of this photo. What von Luck didn’t know was that the church was being held by a different battalion to the one he’d been fighting up till now. The men of 13 Para were fresh and a full platoon was defending the area around the church. Kampfgruppe von Luck would be throwing 2 Platoon into the attack, which was short two men so wouldn’t be fielding their Panzerschreck. On paper the paratroopers had more men, they were of better quality and they were holding a prepared position (including one free entrenchment), but the Germans had access to heavy weapons. Could they make it count? The idea was maximum firepower to pound the British, who were expected to be in hard cover or dug in. 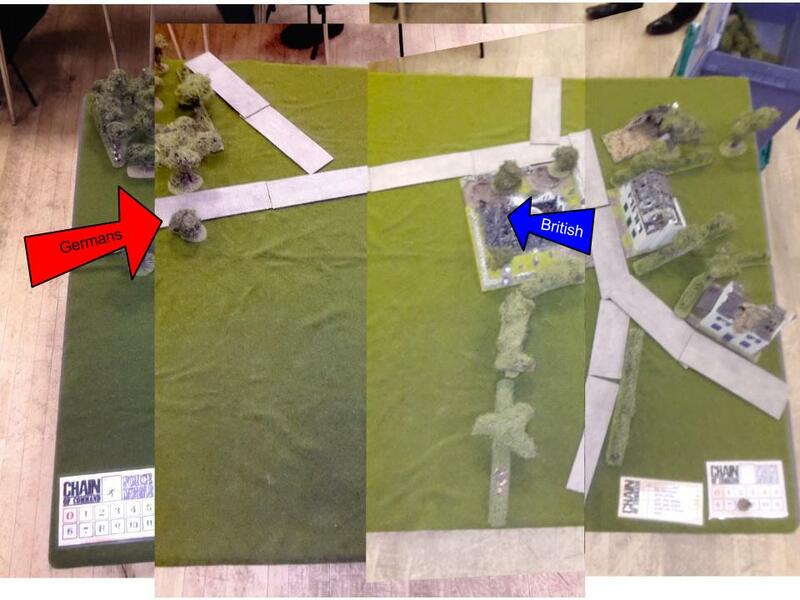 There was minimal cover at the German end of the table, so only one or two squads would be able to deploy until some fire dominance was achieved and supports with a small footprint like snipers and observers would be useful. The Germans are coming up the road from the left. The Paras are holding the area around the church. The church sits along a road which rises up towards the east. It’s surrounded by low walls and has buildings to the rear, but the area the Germans were attacking through was an open killing ground. Cover at the German end of the table is bad, with only a small area of trees. The road at their end of the table was sunken, which would allow vehicles to get into a hull down position as they came up the road. The job for the Germans would be to lay down enough firepower to get some men across the open ground without getting cut to ribbons. Apologies for the really shonky photography throughout this report, by the way. I forgot my good camera and was taking snaps on whatever dodgy mobile device I had to hand. German patrol markers in the sunken lane and the small woods. The British went for a 2-up 1-back defence. There was little opportunity for finesse in the patrol phase. There was no way the Germans would be able to get their markers across the open ground into cover, and both sets of patrol markers met in no-man’s land. I tried to make a shift to the right flank to skew their deployment zones away from the best cover, but it was easily countered. Both sides rolled 1’s for force morale, so everybody must have crawled out of the grumpy side of their foxhole this morning. For the Brits this meant morale of 8, and 9 for the Germans. The German platoon commander is ridiculously popular with his men at this point, so gets bonuses for morale. As the German player one big factor was going to affect how the game went: would the SP howitzer’s luck hold? So far Phil’s PIATs hadn’t managed to claim one, despite several attempts. Generally speaking a PIAT will get one shot off before the howitzer can reply, and that reply is usually pretty messy. Sooner or later a PIAT was going to hit the flimsily-armoured SP gun, and there’s always the risk of a second PIAT. Plan A was for the howitzer to turn the church and everything around it into a moonscape, Plan B was for the mortars to disrupt British visibility and neutralise some troops. Hopefully one or both would be enough for the infantry to pull off some fire and manoeuvre across the open fields. The sniper was coming along because he’s good against troops in cover and small isolated teams (like those PIATs). To be honest I didn’t fancy my chances of successfully advancing across open ground against a full strength platoon of dug in elites and was out to even the score at long range. The only way regulars can do this against elites is with heavy weapons, as small arms fire from elites is twice as effective per d6 in a long range fight. An elite British section with a Bren gun will outshoot a regular panzergrenadier one with two MG42s at anything over 18″. The job on the British side was pretty simple: hold at all costs. This platoon was expendable, even if they fought to the last man there were fresh Paras holding the campaign’s final objective. The game opened with a German sniper crawling forward into the woods, but nothing could be seen. On the British side another sniper also took up a position in the hedges on the British left flank. Neither side was willing to show its hand early and a few phases passed quietly until the Germans rolled a three and duly brought up their 15cm sFH 13 Lorraine Schlepper howitzer. The big gun trundled up the sunken lane and took up a hull down position where it could cover the open ground in front of the church. The gunners chambered a round of HE and scanned for a target, while a section of panzergrenadiers moved into position in the adjacent woods and went on overwatch. Up until now Phil had rolled an impressive number of 5’s and built up a good store of Chain of Command pips, so the German mortar observer stayed off-table until in was looking more like mortar weather. Even with the growing numbers of Germans on table the British stayed quiet, so with his fire support in position the German commander sent up his first assault group. A section moved up the sunken lane past the SP howitzer and fanned out onto the open ground, moving tactically. Now the British struck, with a rifle section announcing their presence in the church and behind the stone walls surrounding it. “Contact front!” came the cry as rounds cracked past the German troops and beat up the dirt, but nobody was hit, and the troops on overwatch answered for their comrades, two MG42s peppering the stone walls around the church. The howitzer arrives while a sniper (bottom) watches out for PIATs. That’s a JoP in the middle. The Paras trying to hold the “Church on the Flank” in KvL game 4. The 2″ mortar joined the party and started dropping smoke in front of the howitzer, and both sides started trading heavy fire. Whenever the command dice allowed this also included shots from the big gun, and bits of church started flying. A few casualties started to rack up on the British side, and so the Paras committed their weapons section with two Bren guns and another sniper. By now however the Germans had caught up in the CoC dice race, and brought up their mortar observer. After a couple of phases of fire from the Bren guns the Germans brought down a thunderous mortar bombardment smack on top of the weapons section, neutralising them. Phil spent a CoC dice to end the turn, but I answered with one of my own to keep the bombardment in play. The view from the British position in the church. Two German squads and a big nasty gun opposite. The mortar bombs rained down on the British left, and both snipers caught under the barrage were hit fairly quickly, taking a slight knock to British morale. The gun teams fared better though, with minimal casualties. Shock began to mount, to the point where a precious senior leader was eventually deployed into the barrage to help keep things together. Meanwhile, with the Bren section neutralised the fight for the church raged on. One Para rifle section was holding a good position in hard cover, but facing two panzergrenadier sections, a sniper, and Big Bertha. The latter actually wasn’t scoring many kills, but it was adding buckets of shock. The Paras had managed to pin the German squad that had moved into the open, but soon became pinned themselves, which meant they didn’t have enough firepower to finish the Germans in the open off, and weren’t able to fall back in the face of the pounding they were taking. The British platoon sergeant was doing his best to keep the boys in shape, and at one point did manage to rally enough shock and with a CoC dice to end the turn briefly unpinned the section, but they had lost several men now, and quickly became pinned again afterwards. With hindsight it might have been better to use that brief window to fall back, but I think Phil was still focussed on chopping my boys up out in the open and didn’t want to give that option up by falling back into the houses behind the church. Things were now looking very wonky for the British, as they’d just not managed to kill enough Germans and were losing more men than they could afford. The big howitzer was just blasting the church relentlessly, and it was time to reply. The gun was hull down and at extreme PIAT range, but the British had to try and silence it. Phil had held off using his PIATs on such low-percentage shots, but muttering something about “desperate times, desperate measures” he pulled his first PIAT crew out of the box. It would be an 11 to hit. Not impossible, but a bloody tough shot. I think we both held our breath as the dice tumbled…and the shot missed. In the German phase I rolled no 3’s so the big gun was unable to defend itself. The German platoon commander yelled at his MG42s to switch targets, and tracers sped down the road, bouncing all around the PIAT, but scoring no hits or shock. The German sniper joined in, and calmly put a bullet through the #2 on the PIAT as the gunner frantically reloaded the unwieldy weapon. Undeterred the paratrooper lined up for another shot at the German gun…another miss! This time the artillerymen fired in reply, and the big HE round landed near enough to the PIAT gunner to send him packing down the road to hide in a ruined house. This was another hit to British morale, which by now was starting to sag badly. With the howitzer still in play the inevitable happened and the rifle section in the church announced they’d had enough and fell back, dragging the platoon sergeant with them. Despite the fact he was wounded himself the sergeant left the section’s leader to sort his men out and headed back towards the fight, barking orders to throw in their last reserves to hold the line. A fresh rifle section deployed into the church to plug the gap left by the retreating men, while two more men brought up another PIAT to finally silence the howitzer. Unfortunately their only firing position was the same one the earlier PIAT had used; another tough shot needing an eleven. As the dice rolled and the first one came up as a six I thought he might have done it…until the other dice came up as a three. Woosh-bang! Another PIAT round exploded harmlessly behind the howitzer. In brighter news for the Brits, the new section clearly had all the platoon’s best shots, as they quickly put several kills down on the German section in the open, including the squad leader killed stone dead. The German platoon CO had earlier moved out of the woods into the open with that section to manage the amount of shock on them, and the new dead-eyed British lads tagged him, too. Luckily for the Germans it was only a light wound, but these two leader hits chopped German morale from 9 down to 5. British morale was even lower though, having dropped to the point they were losing command dice and they soon had to give up a JoP as well. It didn’t make much difference which one I took, but I chose the one near the troops under the barrage. An excellent shot from the howitzer finally scored some decent kills, with four paras falling from a single shot. This really kicked the guts out of the rifle section and it became obvious they would go the way of the first rifles fairly quickly. The second PIAT team also fared worse than the first one and it didn’t manage to get a second shot off before breaking due to a hit and heavy shock. With that “team breaks” roll British morale slumped to 1 and Phil announced that 13 Para had had enough for today and would be pulling out. 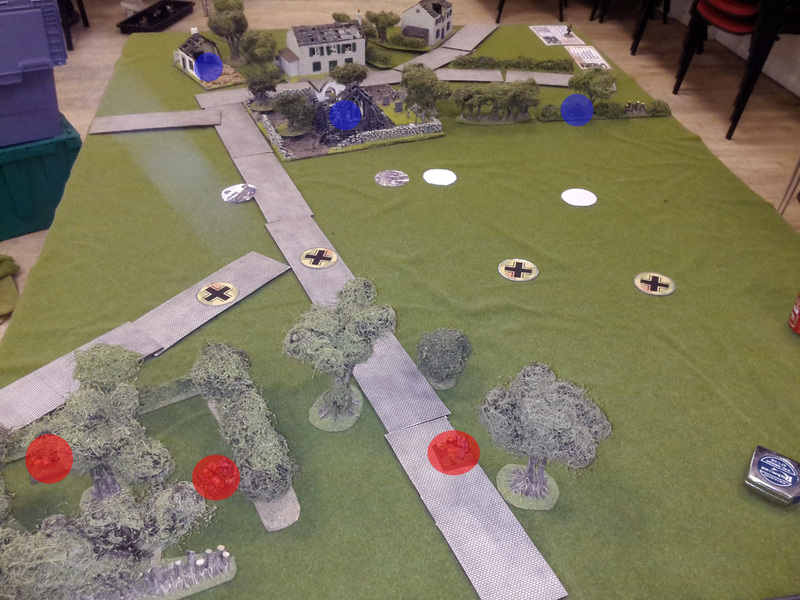 The Germans had taken the “Church on the flank”, although with the amount of 150mm howitzer rounds thrown at it during the game we agreed that Phil’s nuked church model was probably a very accurate one to have used. Horrible stuff for the Paras. Eight dead, four wounded. This platoon only fights in this scenario, but just for a laugh I rolled the dice for their withdrawal. Pretty much everything in their platoon was pinned or broken, and sure enough 6 more men were rounded up by the Germans, with another seven missing, including the gutsy platoon sergeant. The platoon had gone into action with 37 men, it would be coming out with 18. Ouch. German force morale ended on 5 over the British 1, so most of the five miniatures taken off the table during the game would be coming back. The sole German casualty was the leader of the section that had tried advancing across the open, killed in the late stages of the fight. So they’d be bringing a dodgy noob JL to their next party. Major von Luck is a happy chappy, boosting his opinion by another two points. That’s not enough for any further bonuses, but means he’ll be a bit more tolerant if I muff it in the next game. The men were pleased about another fight where they caused a lot more hurt than they took, but were clearly a bit upset about losing one of the NCOs, so on balance no change there. Likewise the platoon commander’s mood stayed steady on “Affable”. This means the Germans are still carrying some good bonuses (eg: +3 to force morale rolls and +1 support). The campaign has gone well for them and everybody smiles when they’re winning. The German attack switches back to positions held by 12 Para next, so the Brits have their last fresh unit to try to hold the line. That’s a big ask, as they’ve now got to win three games on the trot without any reinforcements. That’s 37 men, facing up to 94 Germans. Time to show what you’ve got that red beret for, fellas. The Germans can send in either the 33 men of 3 Platoon (which actually hasn’t fought yet) , or 1 platoon with 31 men. If you’re in a firefight that you’re thinking you might lose you’ve got to make the decision to get out early. Once you’re pinned you can’t pull back and you’re on the downhill slide to breaking and giving up force morale points. Vehicles in hull down positions are vicious, and extremely hard to hit with antitank fire. Force them to move with smoke, drop mortar bombs on them, or if the terrain allows manoeuvre to get a better shot. Medium mortars are really good at clearing out snipers. Each sniper takes four hits every time the barrage activates, and it only takes a single kill result to finish them. Open ground works both ways. A defender can use it to create a killing ground to catch advancing troops, but an attacker can also use it to stand back with heavy weapons and soften up the defence. If that’s on the cards, the defender is probably better off staying off table and drawing the attacker in close.